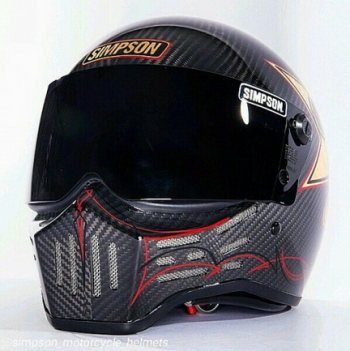 Since 1959, Simpson has built a dedicated world of producing helmets of the highest pedigree. 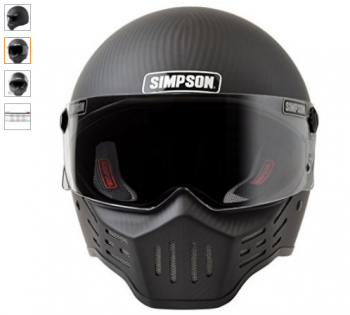 After the 70‘s release of the iconic ‘Bandit Helmet’, Simpson has become a worldwide icon in sporting the Simpson M30 Carbon Fibre Helmet in international motorcycling events. 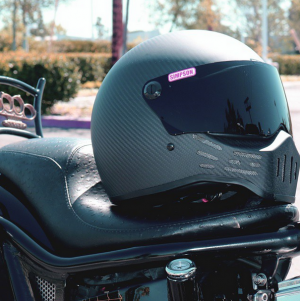 Worn on the heads of the best motorcyclists around the world, this sleek black helmet provides maximum head protection from injuries with an added advantage- style. 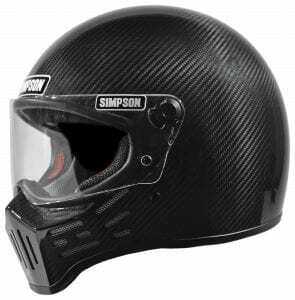 The Simpson M30 Carbon Fibre Helmet is made of lightweight materials with an ergonomic design to keep your head secure in something as minor as a typical road trip wound to something as major as an extreme motorcyclist crash injury. Just read a few of the reviews on this helmet and decide for yourself. Helmet Style or Your Style. The design concept of the Bandit Helmet is as what its name suggests. This slick-looking helmet comes with a cool mouth protective gear. Unlike typical motorcycle helmets that come with the curved pointed design, the Bandit Helmet is designed to look the way it functions. It protects the mouth and the jawline well. In addition, the helmet comes with different shading for your eyes. The shield may either be clear, chrome and light smoke. 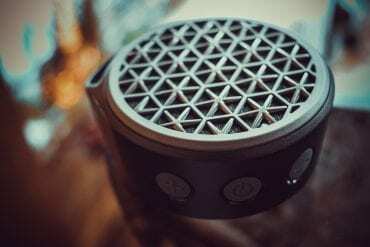 The shell is made of a lightweight composite shell. It’s inside padding is lined with COOLMAX brand lining. This ultra-moist reducing fabric allows your head to breathe inside the helmet. It keeps you cool by providing a comfortable and breathable airspace without having those wet and sticky sweat sopping your face. It comes with removable and washable cheek pads to easily handle the common foul manly smell of a helmet. Aside from this comfort lining, the protective ability of this helmet is provided with a ‘FreeStop’ shield pivot system, in other words, it’s tight on any angle making sure your head is intact against any impact. And because of this system the Bandit Helmet is definitely shock-absorbent. Weight and Sizes: The Lightest. With the Carbon Fibre as the bulk of the material on this helmet, it is actually half a pound lighter than non-carbon helmets. It comes at a lighter weight of about 2.5 pounds on average that allows your neck to rest from that excessive weight. The chipped off weight allows the different sizes to fit your different head sizes. The Bandit Helmet comes in 4 dimensions: Small (55-56 cm), Medium (57-58 cm), Large (59-60 cm) and Extra Large (61-62 cm). This less heavy helmet is DOT approved making sure your head protection gear is at its best. 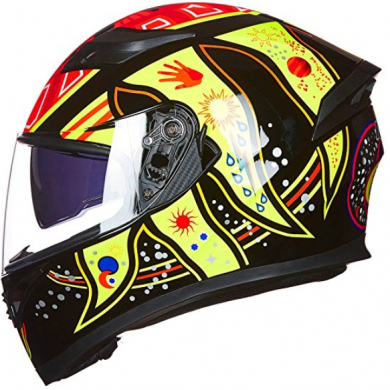 The helmet is that protective head gear that we must wear when riding bicycles or motorcycles. 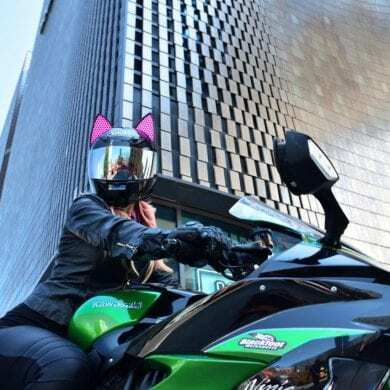 There have been intensive campaigns regarding the usage of helmets and many governments have implemented laws to apprehend those who ride without helmets. In fact, wearing a helmet is compulsory in many countries. Physicians around the world keep reminding the public how important it is to have such safety helmets since such device helps in preventing minor head wounds to major head injuries such as brain damage; this comes as a result of what they have seen and witnessed. Wearing a helmet is an important habit because one tragic crash can lead serious injuries or even death. One thing we should understand is that helmets are 90% effective in head injuries. A good helmet should be able to fit rightly on the head and it must allow for backwards, forward and side to side maneuvers. When you are in the shop, wear and test the helmet and make sure it’s comfortable on your head by moving your head and down, if there is any discomfort or pressure when wearing it then that shouldn’t be a good helmet. The helmet shouldn’t move when you shake the head.